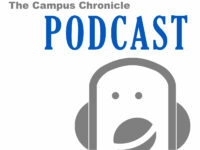 This is the first podcast of a series dedicated to exploring DMACC employees and their jobs. Hosted by Bailey Perkins, listen along as he explores some interesting programs offered here at DMACC and the people behind them. On this Episode: Erin Lee, Digital Marketer for DMACC. In this episode of Small Talk with the Chronicle Crew, Bailey, Laurenn, Ben, and Sarah talk about their classes, a new bible literacy bill, and the influence of social media.